Dec 24, 2018: The Eicher Pro 1080 comes with four-cylinder 3.3-litre engine that can produce a maximum power of 110 bhp along with 350 Nm of peak torque. A 5-speed manual gearbox transmits the power to the wheels. The truck can get to a maximum speed of 95 kmph. It features a tiltable cabin and a deck body type. It has a good payload capacity of 5.46 tonnes out of the 8.25 tonnes of gross vehicle weight, while the ground clearance is a decent 210 mm. Getting inside to the driver’s cabin, a tiltable power steering, a driver information display are the notable features. The vehicle comes with hydraulic brakes that offer good stopping power. Parking brakes are offered too. Eicher Motors and Volvo group joined hands for makeover of the commercial vehicle industry in India and hence the Eicher Pro Truck series was launched subsequently in the year 2013. Now, after a couple of years later, the Volvo Eicher (VE) Commercial Vehicles venture has carved a niche for itself with the best in class Pro series trucks and Pro 1080 is holding the flag in 5-14 tonnes weight category. Eicher Pro 1080 has all the Series specific features like optional AC, cruise control and telematics, while its newly developed and now trusted engine technology produces effective performance and mileage. Its suspension, axles, brakes and body material has also been chosen to ensure the top-notch safety. The cabin is well-designed with cozy enough seats, GPS and other drive-friendly utilities. Talking about the applications, it could be a good distribution truck, FMCG goods carrier, construction material supplier and its aluminum container variant could be used for fluid material transportation. Packed with VE’s E483 4-Cylinder 3,298 cc Intercooler Turbocharged Diesel engine, Pro 1080 gets 93 bhp power @ 3,200 rpm and a peak torque of 285 Nm @ 1,440 rpm. This much output is able to not just move, but make the truck run on not-so-friendly Indian roads with full load. More to the performance, the 5-speed transmission gearbox with hybrid GSL takes it to a top speed of 90 km/h and is able to achieve decent gradeability of 24%. Paired with 275 mm diameter Single Plate Dry Type clutch, gear transmission is smoother and the BS-III emission norms keep the trip environment friendly. Available in 2 wheelbase options of 3,515 mm (A) and 3,765 mm (B) with turning radius of 6,900 mm and 7,300 mm, respectively, the cargo body length sits at decent span of 4,315 mm and 4,960 mm. Both the 2 wheelbase options are available in 4 body types each, i.e. ; Cabin and Chassis (CAB), Fixed Side Deck (FSD), High Side Deck (HSD) and Drop Side Deck (DSD) with an Aluminum Container option available only with 3,765 mm wheelbase. However, the Ground Clearance and Cargo Body Width of all the variants is same 210 mm and 2007 mm. The payload capacity and kerb weight of A & B are 5,460 kg and 2,790 kg & 5,130 kg and 3,120 kg, respectively, but the Gross Vehicle Weight (GVW) is same, 8,250 kg. Although its Aluminum Container variant has the GVW of 8,750 kg with payload capacity of 6,555 kg and kerb weight of 2,195 kg. Its 100 Litre Fuel Tank capacity ensures that it travels intermediate distances with ease. With Vacuum Assisted power steering, which is able to tilt 6 degrees and move 30 mm telescopic, the drivers need not to put much effort in while moving the truck forward or reverse, on sharp turns or on highways. Supporting the bump-free drive, there are Semi-Elliptical Laminated Leaves with Shock Absorbers acting as the front and rear suspension. Also, its Forged I Section Reverse Elliot Type front axle and Fully Floating Banjo Type rear axle distribute the weight efficiently for better balance on different roads. Eicher Pro 1080 is equipped with Hydraulic Service brakes with Air Brakes available as an option, Standard Automatic Vacuum Assisted Exhaust brakes and separate parking brakes. This whole braking system with 7.50 x 16 - 16 PR tyres are able to stop the truck at any given instant irrespective of the roads. To enhance the safety more, there are seat belts, high strength material manufactured cabin and robust base structure so that the occupants stay safe during any mishap. 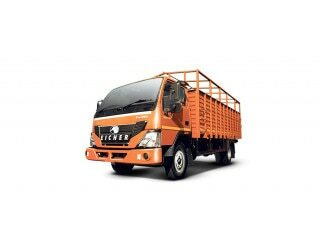 Eicher has developed Pro Series with many changes and the design part is now better than other contemporary trucks. This Pro 1080 also has some tweaks, though not as good as the other heavier members from same series, but significant enough to be noticed. The front radiator grille has a new design with re-shaped headlights, aerodynamic cabin design with foot steps to climb and wider windscreen. Inside the cabin, there is AC option available with other options like telematics, GPS, cruise control and stereo. The seats are also comfortable enough to counter trip fatigue and the instrument cluster has many warning buzzers like for over acceleration, battery and lights making the overall interior decent.